The weekend flew “past” ! I was all set for a busy weekend at the sewing machine, but no, the sun came out instead. The garden, or rather undergrowth, was calling me and my t’other half to come out and cut it back before winter. Not a small task, hacking through two years growth and thinking I wish I was doing something more creative than destructive! Anyhow on the last of 3 three runs to the recycle centre with the 7th huge builders sack of debris there was a rumble in the jungle. Over our heads flew 5 Spitfires and a Hurricane giving us a huge “Well done” for our efforts. They were obviously going home after a very busy weekend celebrating the 75th anniversary of the Battle of Britain. What a sight they were and they brought a lump of emotion to my throat. Back to the sewing machine then. I went to one of my sewing groups on Friday to see how to ” Whack and Stack”. 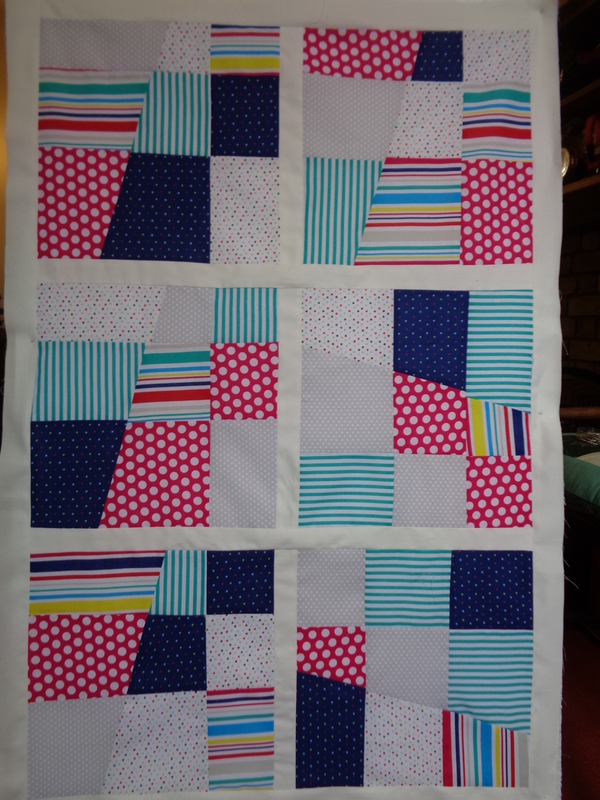 Well it was not what I thought, probably a relief all round, but a random way of cutting and piecing patchwork. I am not sure I am now a fan of the method but perhaps it was just the choice of cottons I used? I put the sashing and border on this morning and think it may suit a summer beach house or the garden shed, neither of which I have! 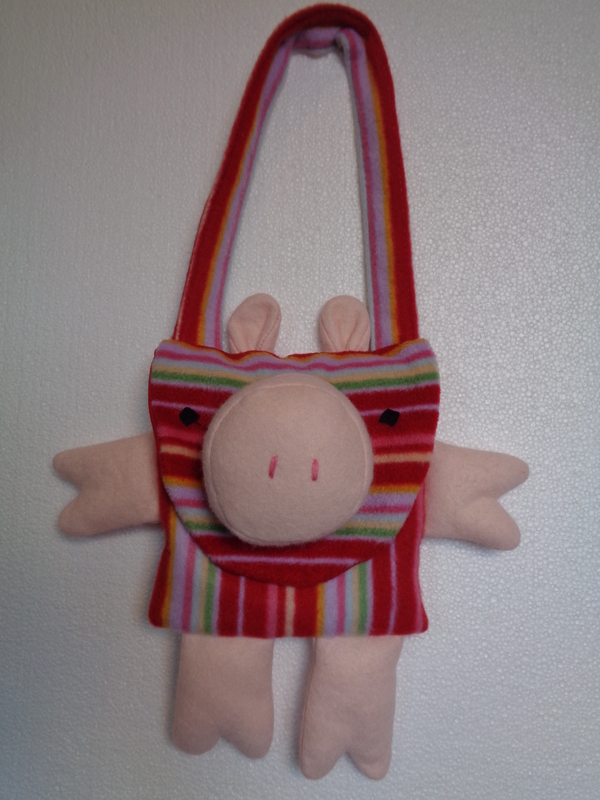 I also made a piggy handbag for a little girl, and I have put it in my shop on Etsy. I made one for my great niece for her birthday in August and it seems it was a hit, so I hope others like it too. Was fun to make and the pattern shows other animals to sew up so perhaps I will make those too. Pictures say more than words so here you go! Well I think the quilt is wonderful, all those cheery colours and almost abstract design and as for the bag – adorable! Thank you so much, it Spurs me on!